I grew up in a small town where everyone knew everyone. Well, almost! You get the picture. From the milkman to paper delivery guy to grocer to sales man/women at retail stores were known and addressed by their first names. The close community and helpful neighbours meant the crime rates were almost nil except for one or two occasions of some petty robberies. We grew up as kids or how every kid should grow up, fearless and happy! Yes, I am lucky to have a wonderful childhood, untouched by any kind of fear, hatred, or religion/state/caste boundary… My childhood was like any childhood should be…filled with laughter, innocence and mischief! Living in such small town was more of a fun when everyone lived together as one giant joint family celebrating different festivals as one community. We celebrated Diwali, Christmas, Eid, Onam, Sankranti as a family, without the caste or religion coming in between us. My friends of other faith would come to our home on the days of Ganesh Chaturthi lured by my Amma’s sweet modak and crispy Chakkuli (Chakli or Murukku). 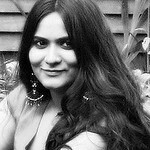 Come Eid, we would rush to our Muslim friend’s home to savour the most delicious Biriyanis and the creamy Semiya Kheer. Onam meant camping at our neighbour’s home who moved from God’s own country, Kerala to our small town, drooling and savouring the very elaborate Sadya. And Christmas… ah… The Christmas meant a beautifully wrapped box full of goodies ranging from cookies to puddings to moist Fruit cakes from my close friends home! With the Christmas just around the corner, I decided to bake some cookies for Lil Dumpling and his friends to spread some festive cheer. And then there was also the fact that I wanted to re-live the days of my childhood where all we did was gorge on delicious slices of cakes after cakes and cookies after cookies. My happy childhood days… The first food that came to my mind was Fruit Cake. Yes, I am very fond of Christmas Fruit Cake studded with crunchy nuts and juicy dry fruits. The best ever Fruit Cake was made by my friend’s mom who incidentally happened to be my primary class teacher too :) The crumbly cake with just the right amount of sugar and spice was enough to make me dream about it for the whole year, until the next Christmas day! 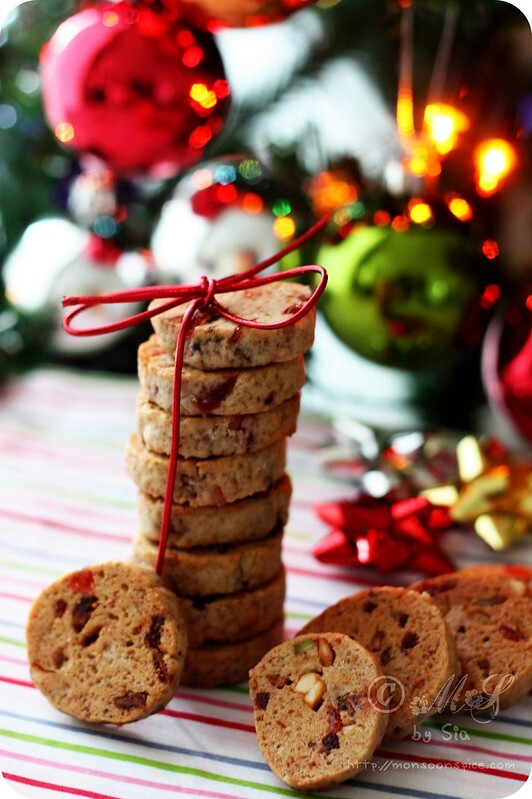 So in my eagerness to search for the best Christmas cake, I came across not just many recipes of Fruit Cakes but also the recipe for Fruitcake Cookies! 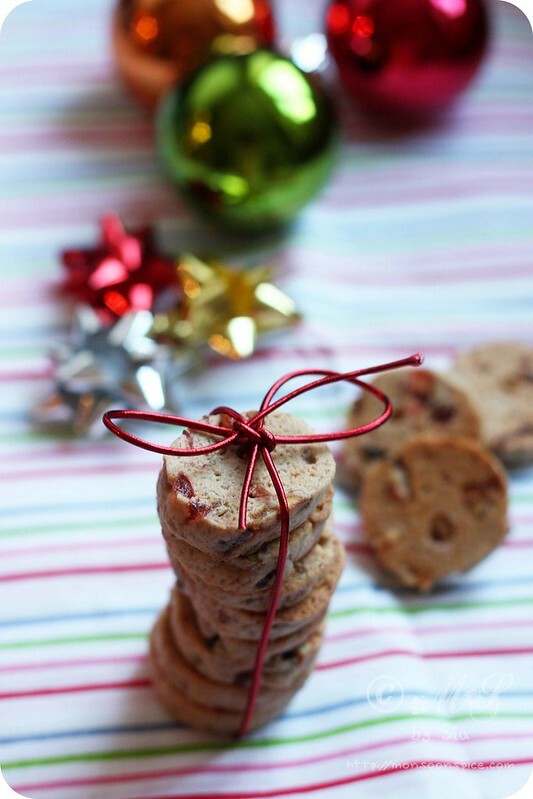 Eggless Fruitcake Cookies ~ Spread some Christmas cheer! Now the Fruitcake Cookies in question looked very similar to the Karachi Bakery’s Fruit Biscuits (which has another long story behind it and I’ll save it for another post). After sifting through many recipes I came across Ina Garten of Barefoot Contessa fame recipe and also Priya’s Eggless Fruitcake Cookie which she had adapted from Ina Garten’s recipe. For the past couple of weeks, Lil dumpling has been showing few signs of allergic reactions to eggs and I decided to bake a batch of Eggless Fruitcake Cookies by substituting eggs with ground flax seeds. I have followed Priya’s recipe with little changes and the end result was one the best tasting cookies I had made in a long, very long time! For someone like me who has this baking phobia, they turned out absolutely wonderful. 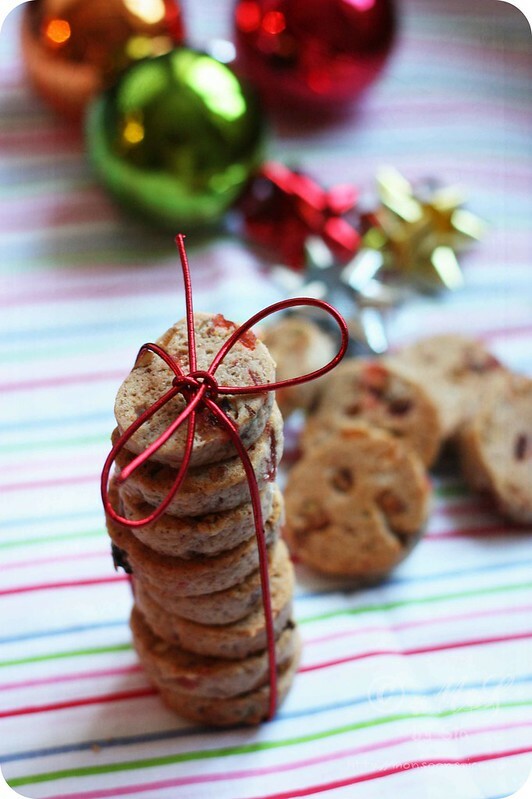 The texture of these Fruitcake Cookies comes in between Biscotti and Shortbread cookies, crumbly melt in treats with a hint of spices. The dry nuts and fruits add a wonderful texture of crunch and juiciness to these cookies. The best bit of these cookies is that the dough can be stored in freezer if you are scared of polishing them off in one sitting! I found them quite irresistible and ended up eating 3 as soon as they came out of the oven! If you believe in treating your loved ones with handmade gifts, then these cookies is one the best gifts you can give on this Christmas and New Year’s time. 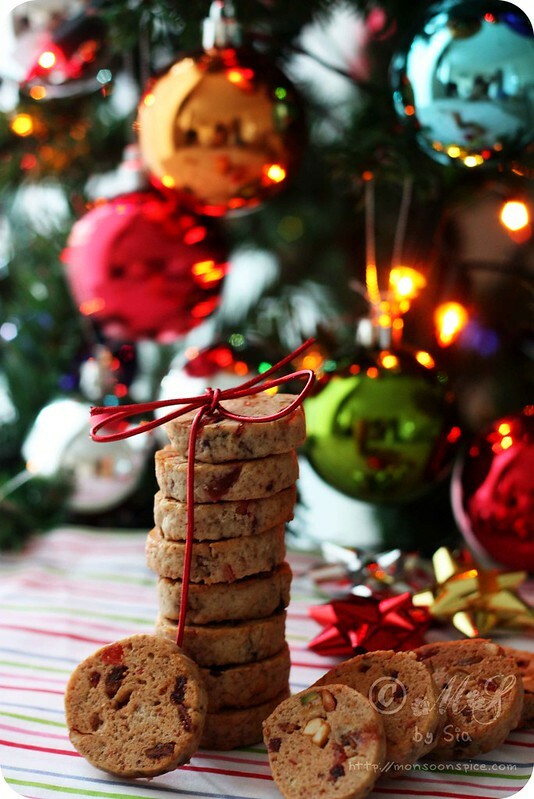 And then, you don’t really need any reasons to bake a batch of cookies to indulge in! So make some and spread some happiness… The world needs it! Snip off the hard stems of figs with a help of a small knife and chop them to small pieces. 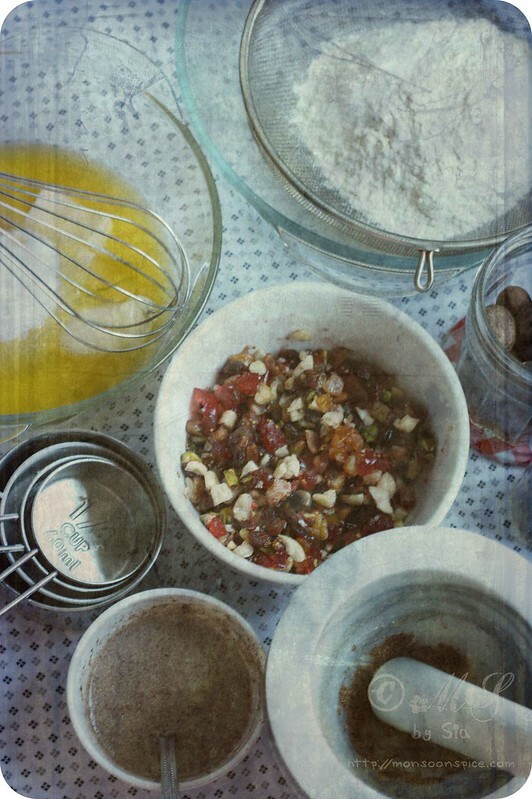 Similarly chop the candied cherries, raisins, cashew nuts and pistachios to small pieces. You can use any dry fruits or nuts of your choice. Place all the chopped dry fruits and nuts in a bowl and add red wine/dry sherry/mulled wine/mulled punch or orange juice. I have used orange juice as I didn’t want to add any alcohol to this batch of cookies made for my little one. Next time I plan to use either red wine or dry sherry. Next add freshly squeezed lime juice and honey and mix them well. Cover the bowl with cling film and allow it to rest overnight at room temperature. 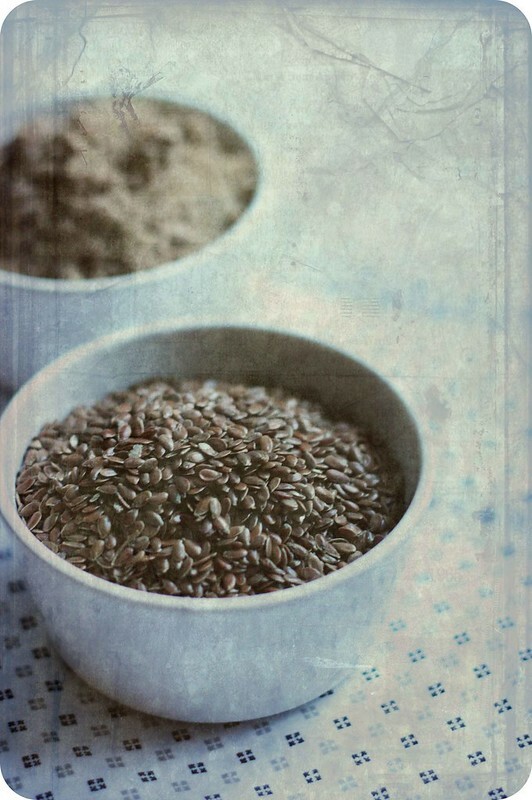 Mix ground flax seed with 2 tbsp of water and microwave for 30 seconds. Take it out of the microwave and beat it with a help of a spoon or fork and microwave it again for 15 seconds on high. Set aside and let it cool completely. Sift 1 1/3 cups of flour to remove any lumps and set aside. Take butter, sugar, vanilla extract, salt, and the spice powders listed above in a wide glass bowl and cream/beat it with a help of a whisk or hand mixer (on low speed) until all the ingredients are combined well and you get a smooth creamy consistent mixture. It took me 2-3 minutes in a hand mixture. Now add the flaxseed mixture and the flour in batches, 1/3rd portion at time. Mix it at a low speed if using hand mixture. I found the cookie dough very sticky and hence I had to add 2 extra tbsp of flour to the mix. Mix it with a help of a spatula. 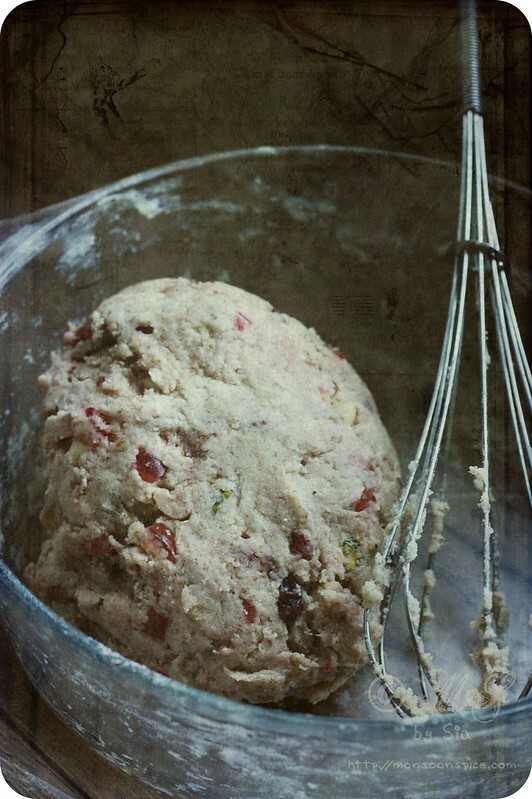 Make sure that you don’t over mix the dough as it will develop gluten and the cookies will turn quite hard once baked. 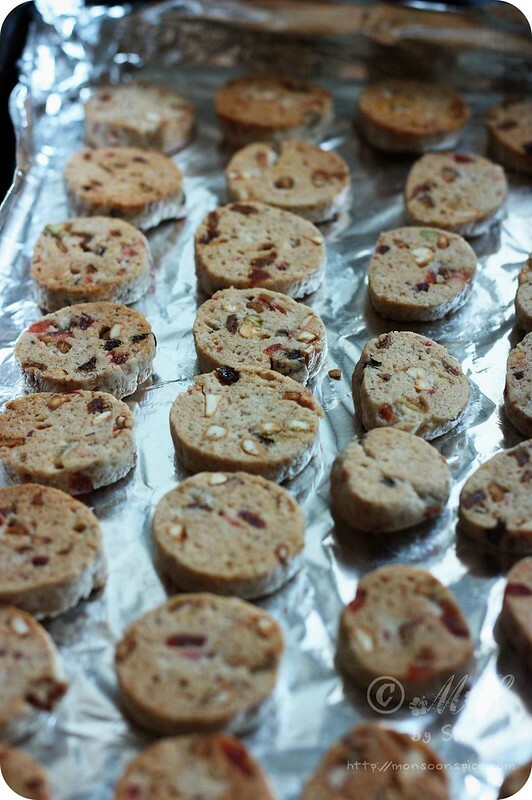 Add the dry fruits and nuts along with the liquid in which they were soaked and gently fold it into the cookie dough. 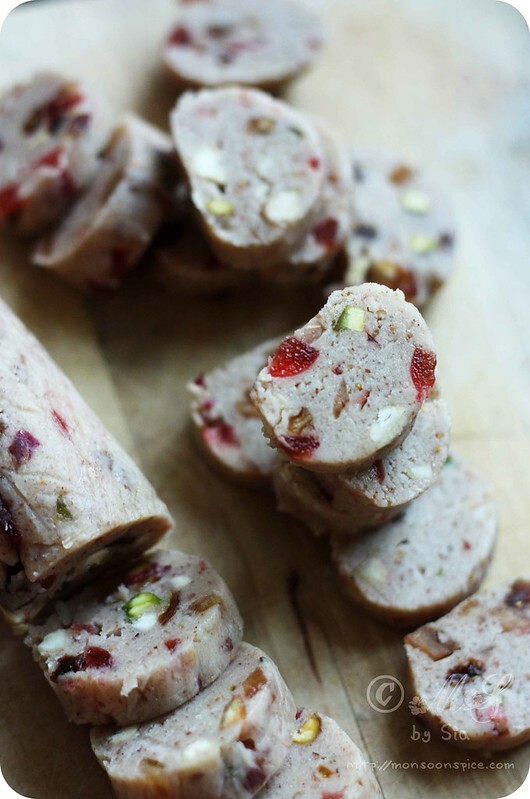 Next divide the dough in half and roll it in to long log/sausages of 2 inch circles on a dry surface or parchment paper. If you find the dough to be really stick and difficult to roll it, just lightly wet your fingers with water and shape them. Please note that these cookies do not spread and hence the cross section of the cookie log will give you the final shape or size of the cookies. Gently move the cookie to the cling film/parchment paper and roll the cling film around and seal the edges. Repeat the same with other half of the cookie dough and refrigerate for 1-2 hours or until firm. If not using immediately, you can store them in a freezer. Pre-heat the oven at 175 deg Centigrade or 350 deg Fahrenheit. I baked them at 165 deg C with the oven fan on. Line the baking tray or baking sheet with a parchment paper or aluminium foil. There is no need to grease the paper/foil as the fat in the cookie dough will not make them stick. Take out the cookie rolls from fridge and cut them into ½ inch thick rounds with a help of a sharp knife. 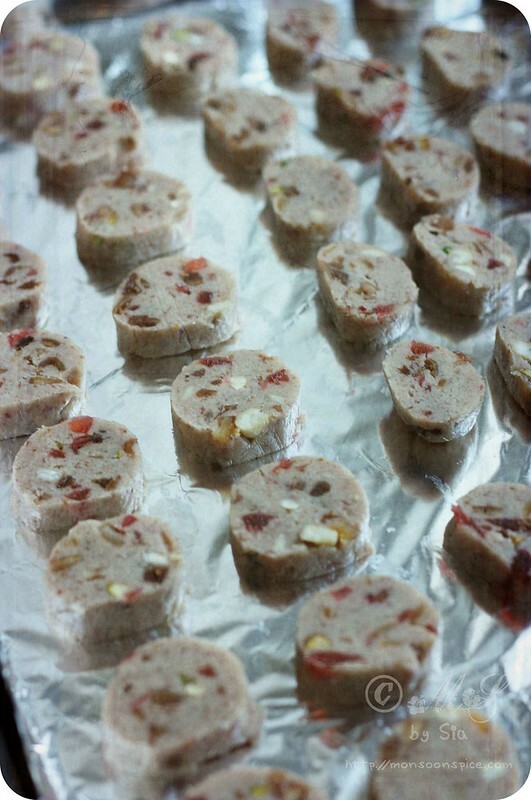 Arrange them on a try in a row, ½ inch apart and place them in a middle rack of the oven. 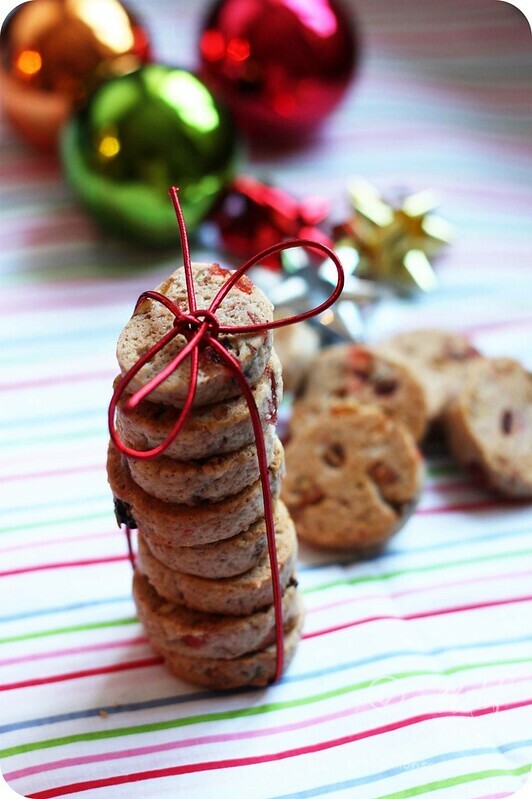 Bake these Eggless Fruitcake Cookies for 15-20 minutes, keep a close eye on them after 15 minutes and check them once after 1 minute interval after that. Take them out of the oven when the edges start to turn light golden. It took me 17 minutes in my oven. Remember that they will continue to cook for few more minutes outside the oven. Lift the foil and place it on the counter-top so that the residual heat from the baking tray/sheet doesn’t over cook them or burn them. Ground flax seed is the egg replacer here and it can be replaced with 1 medium egg. Whisk the eggs after you cream the butter with other ingredients on low speed until incorporated. And then proceed to mix in the flour. I found the cookie dough very sticky when 1 1/3 cups of flour was used and hence I had to add 2 extra tbsp of flour to the mix. Make sure that you don’t over mix the dough as it will develop gluten and the cookies will turn quite hard once baked. I have used orange juice as I didn’t want to add any alcohol to this batch of cookies made for my little one. Next time I plan to use either red wine or dry sherry. The cookie dough can be frozen if not using immediately. 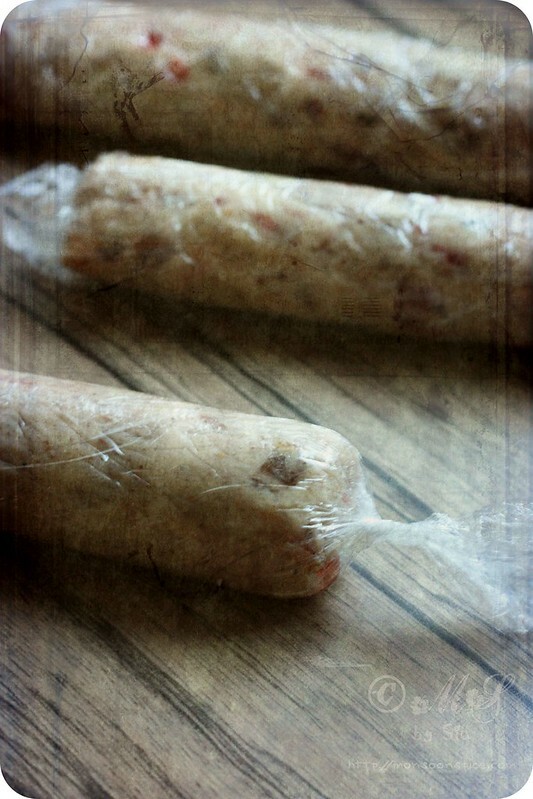 Warp it tightly with a cling film and put it in a zip lock bag before freezing. When needed defrost it in a fridge over night and proceed to bake. Keep a close eye on the cookies after 15 minutes of baking and check them once after every 1 minute interval after that. Take them out of the oven when the edges start to turn light golden. Remember that they will continue to cook for few more minutes outside the oven. So make sure that you lift the foil and place it on the counter-top so that the residual heat from the baking tray/sheet doesn’t over cook them or burn them. The baking temperature will vary when oven fan is on. I baked the cookies at 165 deg C as opposed to 175 deg C with the oven fan on. They can be stored up to a week at room temperature in an air tight container and up to a fortnight when refrigerated. Beautiful cookies! I should make a batch of these for my daughter. She is not really into chocolate so these will be good for her. Those are wonderful cookies! So festive. I agree with both the small town culture and the shoot out. I was born in a small town as well and the situation was very similar. I cried for the babies as well. I am not a mother but even the thought of it is very painful. We can all pray for them. Sia, That's an awesome recipe! Cookie and cake in one. Eggless is a plus for me. Happy Holidays! Sia, such a beautiful post. Yes, I spent a restless night, and hugged my daughter closer too. Tragedies like this always remind me how fragile life is, and how often we waste time worrying about things that aren't important at all. 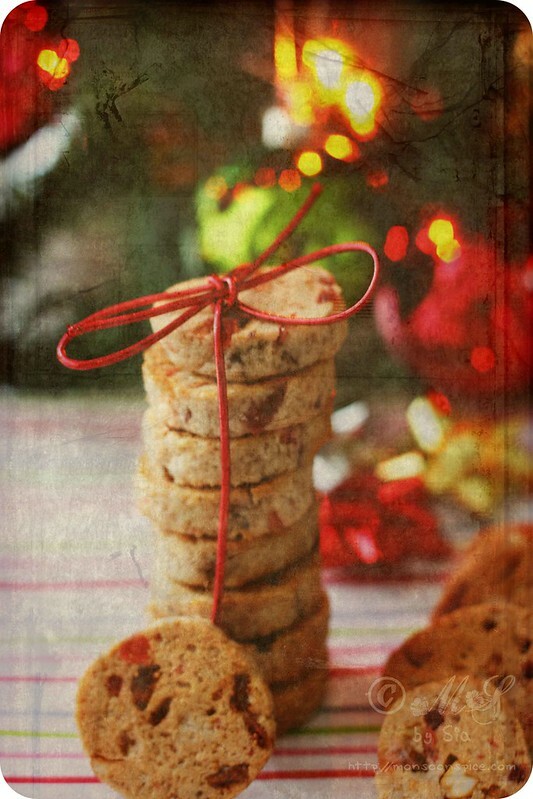 You cookies do spread cheer - the photos are so warm, happy, Christmasy. Chotto-Ma, D and I wish you and your family a Merry Christmas and a very happy new year. Have a lovely holiday, Sia :) Hugs and much love to Lil Dumpling. Can you tell me the effect on the cookies when you use the above spices(nutmeg,clove,pepper corns and honey. Will be waiting for the explaination.